Simpeak Electroplated Case for Apple Watch 38mm series 3 (2017) / Sport / Edition/Nike+ Models. 1. Please confirm the size you need, for 38mm or 42mm Apple Watch. 3. This product does not include any Apple Watch and watch band. Email seller for free to get the support. Lightweight&Slim --- Soft and flexible material keeps your Apple Watch lightweight and easy to install, but also offered good protection. Thin minimal design is perfect for flaunting your new Apple Watch 3. 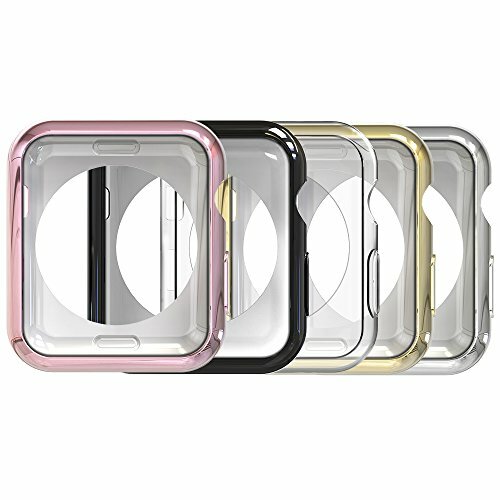 Multi Color for Your Choice --- Come with 5pc Apple Watch case, transparent or Plating case(black, rose gold, gold, silver- which makes your case shinny), different watch band to change the diffferent color case. Perfect Fit And Excellent Protection --- The screen, power button, digital crown and the speaker can fit without having to remove the case, while still having total functionality of the buttons. Every button and hole opening was thought out carefully. 5 year warranty - Refund or Replacement if there is any quality problems, life-time friendly customer service to make our customer 100% satisfied. If you have any questions about this product by Simpeak, contact us by completing and submitting the form below. If you are looking for a specif part number, please include it with your message.